I had not been to Mangalore for more than 2 months, so I decided to go home last weekend. My father had sent me the Kambla timetable by post and Kadri Kambla happened to be right at the same time while I was there. 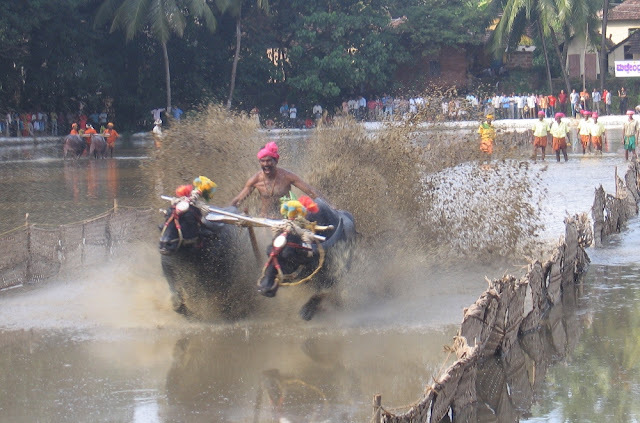 Kambla – means Buffalo race. It’s very popular in south canara district. 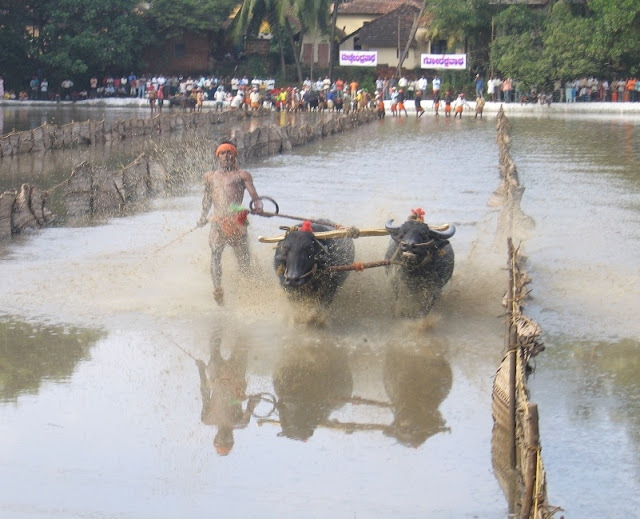 First the paddy fields are turned into a muddy water pool, and then the lanes are created using coconut leaves tied in a form of mat which act as partitions. The first few hours are spent on tug of war and running race. The latter half of the day is the actual Kambla. I had never been to a Kambla before and I was very excited to be there. This particular kambla happens every year only few steps from my grandmother’s house. My cousin and I went there at about 4:00 PM and the game had already started. I enjoyed standing exactly in front of the lanes to click several pictures. Every run is timed and the fastest wins. On the way back home, in the bus, I got into a conversation with a fisherman. He shared his stories about life in the sea. He works for a company that own about 12-15 fishing boats. They spend 2-3 weeks in the sea, several miles away from the shore. For every 2 lakh worth of fish he brings back, he would get an amount of RS 3000. Sometimes the owners ask him to take half the money and the other half next time, which is a difficult situation for them. He visits home only once a month. He also shared how they track any obstacles such as rock or even the nearest shore through a device in the boat. He shared with me how they lay net and drag the fishes along with the boat. Sometimes the ropes get tangled on to the fan and he being an expert in underwater swimming takes up the opportunity to show his skills. Two drivers run the boat on shift basis and four others help them in fishing, cooking and preparing ice to store fishes. Once the diesel falls to reserve, they have to return no matter how much fish they have in hand. He demonstrated how they need to tackle the waves; they cannot speed or neither can they slow down infront of huge waves, if they slow down the boat would turn upside down; well this requires special skills, he adds. I sensed his eagerness to share all this and talk non-stop; he must have been terribly bored by limited conversations in the boat, I thought. 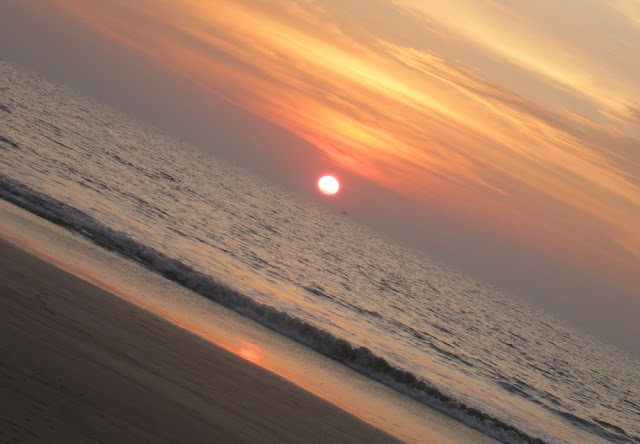 Picture Taken At Thanirbhavi Beach, Mangalore. I returned back with a good dialogue with the Fisherman and I wondered how has this changed me? Quick reply from my mind was – Tomorrow if I am sitting by the beach and see a fishing boat sail over, appearing close to the horizon at the backdrop of setting sun, I know that it means much moré than a picturesque view; the emotions let out by it perhaps can never be captured by any photograph ever. Isnt Thaneerbhavi the place where they break ships? I thoroughly enjoyed reading about Kambla and your conversation with the fisherman. When I see next a fisherman's boat against the romantic backdrop of the sea and sky, I'll also remember what he had to say. Chintu - Well it was pretty scary, we were in the middle and the raging buffalo could anytime turn on us...But it was under control, as though it already knew that its run was till the finishing line. Yes and No, for your question. There is a ship there near the shore which sank few years back. But i recall that there was a big protest against the ship breaking as it would create a lot of problem to the fishes, and it was dropped. @Indicaspecies - Thanks. Yes, sometimes i really feel there is soooo much in this world that we may never know fully about. Glad that you like Mangalore. Enjoyed reading about fisherman's side of story. Very informative and touching. We always see the better part of it but there is so much more to it. Even I have seen some fishermen struggling with their nets on Marine Drive. Going home is one of the best things to do. I was thinking the same as Chintu is "Didnt you get splashed?" @Cuckoo - True. Do visit Mangalore, I am sure you are going to love it. Mumbai is not very far though. 16 hours on Konkan railway. @Drama Div - Thankyou for visiting. Ive heard of it from friends , but now after reading your post , I want to visit mangalore ..I really enjoyed the conversation with the fisherman -its true that we see just beauty, but its beyond that ! @Backpacker - True. I bet you will love Mangalore. Its similar to Kerala if you look at it in a glance, yet so very different in culture and tradition. Lovely lovely post and enjoyed the pictures too.